People waiting around the block in the dead of winter just to get into a wrestling match. This match is not just any typical wrestling match: it’s Beach vs. Boro. Boro has sports rivalries with two towns, Point Beach and Manasquan. Wrestling matches have the best turnout for games against our rivals, both across town and the inlet. Beach vs. Boro wrestling matches has lines around the block waiting in the cold for students, alumni, parents, reporters, and other spectators to come in. Packed into the Point Pleasant Boro Middle School or Point Beach High School, the atmosphere is unexplainable. Usually, the temperature is near freezing in January, but once you step into a small gym filled with hundreds of people screaming, you will begin to sweat. The Panther Pit and Gulls Nest are chanting for their team throughout the match. The student sections play a big part in the matches and games because they bring confidence to the players. To most, the day of a rivalry game may seem like a normal day, but right before game time, it starts to sink in. You get dressed in your school colors and get ready with your friends. When the crowd starts to show up to the location of the game, you can excitement in the air is tangible. You walk over to the student section, stand with your friends, and cheer on your school. For the athletes however, a rivalry week is way different from any other week. You put forth your best effort during the week of practice leading up to the day. Teammates push each other to perform their best in practice so that they’re ready for the game. Practices are more intense so you’re ready for anything that can happen during the game. By the end of the week, although soreness threatens to take over, players push through it to put on a show for their hometowns. Beach and Boro wrestling has been going on for years. Boro has only suffered one loss to Beach in 1998. The most recent match, Beach vs. Boro 2018, was a landslide victory of 57-6. While the match was suspended from 2007 until 2012, it was renewed in 2013 and Boro has kept its win streak alive. This year, the Shore Sports Network may be doing a live telecast of the dual. Since the match has returned, participation has increased significantly in both programs. Point Pleasant Beach and Point Pleasant Boro have had over 40 wrestlers on each team in the last two seasons, impressive for Group II and Group I Schools. Approximately 10% of boys in Point Boro wrestle, even more staggering is approximately 22% of all boys at Point Beach wrestle. Both teams have seen increased success since the rivalry has been renewed: Point Beach has won three consecutive Group I Central State Sectional Championships (2016, 2017, 2018) and Point Boro won its Second Group II South State Sectional Championship in 2018, while finishing in the top 20 in NJ for the first time in school history. Jersey Mike’s Subs sponsors T-Shirts that call this event “The Best Rivalry in the Shore”. The Jersey Shore Interscholastic Wrestling Association awarded this match “Rivalry Bout of the Year” in 2017. This match, due to the rivalry and significance in both towns has created heroes that were not necessarily the most decorated wrestlers but came up in the clutch fighting against Point Beach. The best recent examples of these heroes are Gabe Fattizzi’s legendary pin as a winless freshman in 2015 that sparked a rally when Boro trailed 29-3, to ultimately win 34-32 via walk-off pin by Dan Nobbs. Tyler Tweedie clinched the 2017 dual meet in the final seconds of the third period in the last bout of the night to give Boro a 31-26 upset win against arguably Beach’s greatest team in school history. Head Coach Pat Brady explained, “This is a rivalry that I have been a part of my whole life. I am the youngest of three brothers, I went to Beach vs Boro in the Mid-90s to watch my brothers wrestle, I myself wrestled in this match and now have had the honor of Coaching in it for the last seven seasons. It’s a special match for any Point Pleasant Wrestler,” when speaking about how he felt as someone who wrestled in a Beach vs. Boro dual in high school. School rivalries are a big part of the high school experience. Being a part of the atmosphere is unforgettable for students. 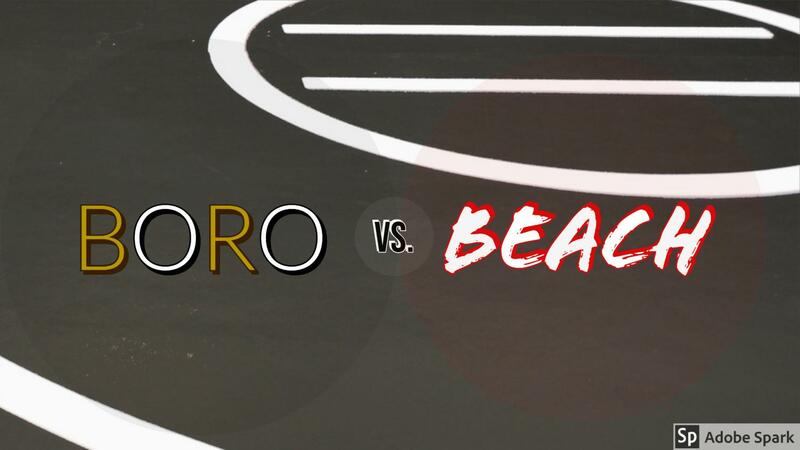 The Beach vs. Boro wrestling match is Friday, January 18th at 7pm in the Memorial Middle School Gym. Great write up of the Boro vs Beach wrestling match. Capturing the essence of what it’s all about. Nice job Dan……great read! My favorite match of the year! Great job with this article Dan!